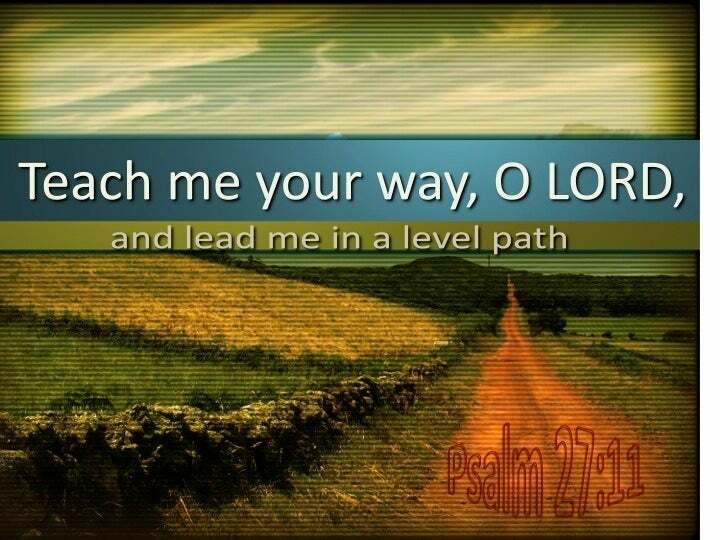 ﻿ Psalm 27:11 Teach me Your way, O LORD, And lead me in a level path Because of my foes. Teach me Your way, O LORD, And lead me in a level path Because of my foes. Teach me thy way, O LORD, and lead me in a plain path, because of mine enemies. Because of my adversaries, show me Your way, Lord, and lead me on a level path. 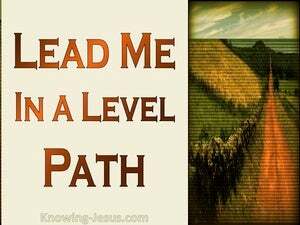 Teach me your way, LORD, and lead me on a level path because of my enemies. Teach me thy way, O LORD, and lead me in a plain path, because of my enemies. Teach me thy way, O Jehovah; And lead me in a plain path, Because of mine enemies. Teach me Your way, O Lord, and lead me in a plain and even path because of my enemies [those who lie in wait for me]. Make your way clear to me, O Lord, guiding me by the right way, because of my haters. Teach me thy way, Jehovah, and lead me in an even path, because of mine enemies. Teach me thy way, O LORD, and lead me in a right path because of my enemies. 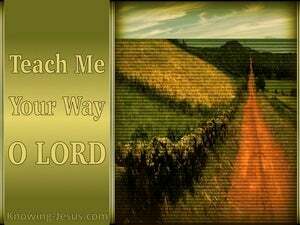 Teach me, O Jehovah, thy way, and lead me in a path of straitness for sake of those pressing me. Teach me your way, O LORD, and lead me in a level path, because of my enemies. Teach me, O Yahweh, your way, and lead me on a level path because of my enemies. Teach me Your way, O Jehovah, and lead me in a plain path, because of my enemies. Teach me thy way, O LORD, and lead me in the right way, because of mine enemies. Teach me how you want me to live; lead me along a level path because of those who wait to ambush me! Teach me your way, LORD. Lead me in a straight path, because of my enemies. Point out to me, O Yahweh, thy way, - And guide me in a level path, because of mine adversaries. Teach me your way, Yahweh. Lead me in a straight path, because of my enemies. Shew me, O Jehovah, Thy way, And lead me in a path of uprightness, For the sake of my beholders. 10 For my father and my mother have forsaken me, But the LORD will take me up. 11 Teach me Your way, O LORD, And lead me in a level path Because of my foes. 12 Do not deliver me over to the desire of my adversaries, For false witnesses have risen against me, And such as breathe out violence. O LORD, lead me in Your righteousness because of my foes; Make Your way straight before me. Teach me Your way, O LORD; I will walk in Your truth; Unite my heart to fear Your name. My foot stands on a level place; In the congregations I shall bless the LORD. Make me know Your ways, O LORD; Teach me Your paths. He leads the humble in justice, And He teaches the humble His way. Who is the man who fears the LORD? He will instruct him in the way he should choose. He will recompense the evil to my foes; Destroy them in Your faithfulness. All day long they distort my words; All their thoughts are against me for evil. They devise injustices, saying, "We are ready with a well-conceived plot"; For the inward thought and the heart of a man are deep. With all my heart I have sought You; Do not let me wander from Your commandments. Let me hear Your lovingkindness in the morning; For I trust in You; Teach me the way in which I should walk; For to You I lift up my soul. For the LORD gives wisdom; From His mouth come knowledge and understanding. "They are all straightforward to him who understands, And right to those who find knowledge. The way of the lazy is as a hedge of thorns, But the path of the upright is a highway. Although the Lord has given you bread of privation and water of oppression, He, your Teacher will no longer hide Himself, but your eyes will behold your Teacher. A highway will be there, a roadway, And it will be called the Highway of Holiness The unclean will not travel on it, But it will be for him who walks that way, And fools will not wander on it. For I have heard the whispering of many, "Terror on every side! Denounce him; yes, let us denounce him!" All my trusted friends, Watching for my fall, say: "Perhaps he will be deceived, so that we may prevail against him And take our revenge on him." Then the commissioners and satraps began trying to find a ground of accusation against Daniel in regard to government affairs; but they could find no ground of accusation or evidence of corruption, inasmuch as he was faithful, and no negligence or corruption was to be found in him. as it is written in the book of the words of Isaiah the prophet, "THE VOICE OF ONE CRYING IN THE WILDERNESS, 'MAKE READY THE WAY OF THE LORD, MAKE HIS PATHS STRAIGHT. So they watched Him, and sent spies who pretended to be righteous, in order that they might catch Him in some statement, so that they could deliver Him to the rule and the authority of the governor. International Standard Version Copyright © 1996-2008 by the ISV Foundation.